We started our bike trip at the Chong View Resort in Thung Khok of Song Phi Nong District of Suphan Buri Province and ended the second day at the Royal River Kwai Resort in Kanchanaburi. The weather was cloudy. Maximum temperature was around 26,1 C. Humidity was 94 % (Source: VTBD). Technical data of the trip was as follows: Total Distance: 73.28 Km; Moving Average: 21 Km/Hr; Overall Average: 11.7 Km/Hr; Maximum Speed: 31.7 Km/Hr; Moving time: 3 Hr 29 Min; Stopped Time: 2 Hr 45 Min; Total Time: 6 Hr 14 Min. Technical problem with a bike on the way. We left the Chong View Resort at 0630 Hr and biked down the Malaiman Road toward the Thung Khok Municipal Food Market; a strange name for a market where there was little food to find. We stopped at the 7-Eleven for coffee and breakfast. When we were close to wrap up, Sean suddenly realized he had forgotten his design water bottles in the bungalow, so he hurried back to the resort to pick his twins; fine for me as the coffee was damned hot and I had some extra time to sip. Finally we left Thung Khok at 0700 Hr. It was a nice cool misty morning in which the sun tried to pierce through in vain. The landscape changed from rice into sugar can fields. We missed our first stop at Wat Bo Saphan and finally halted about 10 Km further when encountering another monastery called Wat Plak Khewa in Nong Sarai. After a minute or ten we left the premises of the monastery and continued toward Phanom Thuan. We arrived at the Ban Don Chedi archaeological site shortly after 0900 Hr. The site was discovered by the Fine Arts Department. Excavations in 1982 revealed important remains such as ancient swords, elephant jaw bones, human skeletons and an Ayutthaya-styled chedi. The site is said to be the battlefield between the Burmese and the Siamese in which Prince Naresuan defeated the crown prince of Burma in a fierce royal duel an elephant back in 1592. In fact there are three contenders for this infamous battle. 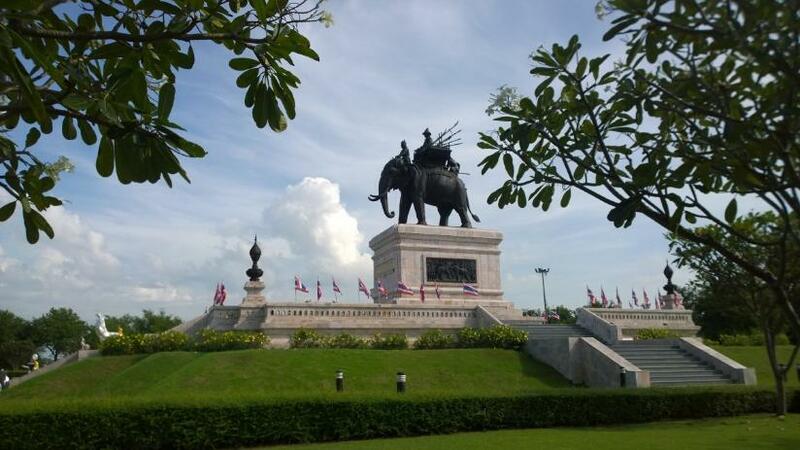 Prince Damrong Rajanubhab identified the Yutthatthi battle at Don Chedi in Suphanburi based on one of the Chronicles of Ayutthaya and on the discovery of a large chedi in that district in 1913. The Burmese Chronicles and the Dutch VOC merchant Jeremias van Vliet identified this battle at Ayutthaya; likely in the Phukhao Thong Fields. Observing the strategic landscape and taken in account the discovery of numerous elephant skulls and bones at this site, we agreed this area must have been once a war elephant battle ground. After having visited a pavilion where the story was explained with pictures and maps, there was a solemn moment to liquidate a Magnum with Belgian chocolate. We left the area about 40 minutes later. Rice fields replaced the sugar cane again. 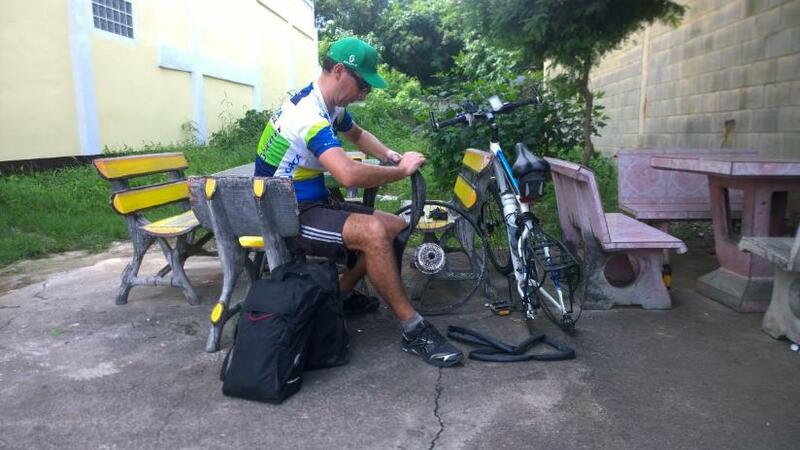 A certain moment Steve lost one of his panniers on the road. Luckily for him an incoming car could avoid the pack and no harm was done. Steve had bad karma that day. 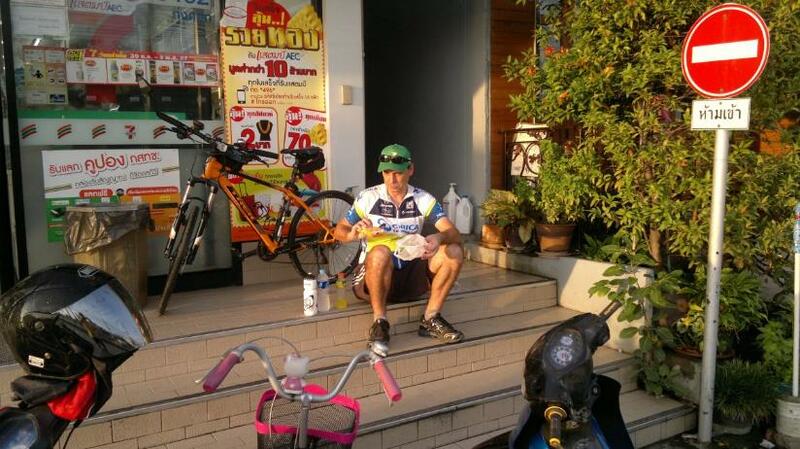 At 1030 Hr, nearing the Kanchanaburi clock tower, he got a puncture. He tried in vain to reach the planned stop at the Don Rak Allied War Cemetery, but when the rim of the rear wheel hit the stones, he had to give up and plunged into an open space along the Saeng Chuto Road to start the repairs. Sean and I waiting in the vicinity of the cemetery returned on our tracks to assist him. Steve had the latest technology on board. The punctured tire was quickly replaced and the CO2 canister to blow up the tire attached; but here rang the Bell of Doom. The regulator failed twice and Steve, not very impressed by his new attribute, became a bit nervous. I suggested to blow up his tire with my old-fashioned hand pump, but he wanted to do it himself and blew my pump into the Heavens of Olympus. I stood a bit perplex as I realized I was depending on that pump. I could not seek help at a motor bike shop or a pump station as I had presta valves (and no bike valve adapter). Doing the coming 700 Km with a damaged pump would cost me much sweat later on. Finally Sean offered his pump and Steve was back on the road again. The punctured tire had cost us nearly an hour. We arrived at the Kanchanaburi War Cemetery and made a quick visit. The cemetery contains the remains of 6982 prisoners of war who died during the construction of the 'Death Railway'; 3568 British, 1896 Dutch, 1362 Australians, 104 Malayan, 12 Indian, 1 Canadian, 1 Burmese and 35 unknown. Initially there were 4 cemeteries in the Kanchanaburi township, one at Tha Makham (a.k.a. Tamarkam) and one at Tha Mueang. Following the Japanese surrender in 1945, the bodies from these cemeteries were exhumed and reburied here, together with those from the cemeteries along the Burma-Thailand railway south of Nieke and other cemeteries throughout Thailand. All the remains of American soldiers were repatriated. A second cemetery is located at Chong Kai along the Khwae Noi. After the cemetery we made a quick visit to the Thailand Burma Railway Center, an interactive museum dedicated to presenting the history of the Thailand-Burma Railway. From there we biked to the infamous Bridge over the Khwae Yai River at Tha Makham. The bridge became history thanks to the novel of French author Pierre Boulle ‘The Bridge on the River Kwai’ and the 1957 motion picture of the same name starring Alec Guinness, Jack Hawkins and William Holden. We took the bikes over the bridge and just as we were near the two steel spans, which replaced the damaged curved spans 4, 5 and 6 of the former Javanese bridge after the war, the train arrived from Bangkok. We pulled our bikes on the safety platform and waited the train passing by. 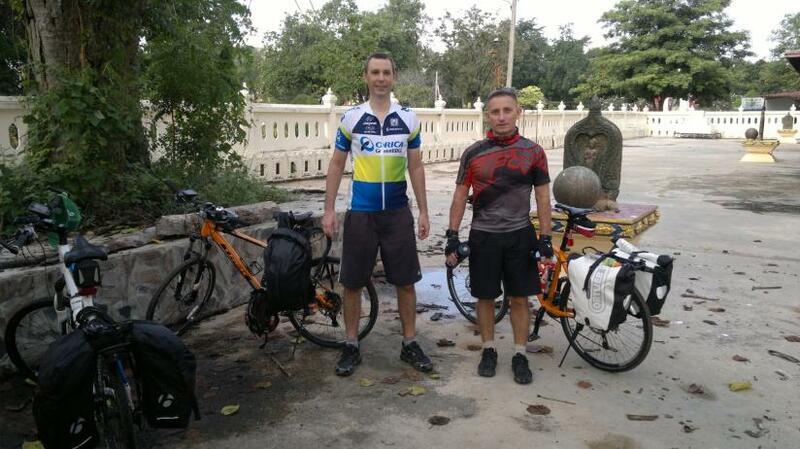 We continued over the track until the end of the bridge, took a small path down the embankment and biked to the Royal River Kwai Resort were we arrived at 1245 Hr. Sean communicated that he had good and bad news. The good news was that he would remain with us till the morning, while the bad news I cannot remember anymore, but I presumed he could not take breakfast with us as he had an early car ride back to work. After a shower and changing clothes we went for lunch at the resort. The rest of the day was spent with a nap, a swim at the pool and an eventful evening visit to Kanchanaburi (which I do not want to elaborate on here).